I got a message from a friend in England the other day who wanted me to get hold of a recipe for samlor ktis - a delicious Cambodian sour soup usually made from fish or chicken and flavoured with pineapple and coconut. A sort of soupy pina colada if you will. She had it when she visited Phnom Penh a few years ago, and missed the broth so much, she was desperate to make it at home. It doesn’t appear on Khmer menus nearly as much as it should. But by chance they served it at the small cafe where I’ve been writing most days for the past few weeks. Considering the place is aimed squarely at expats, with its strange variations of fry-ups, horribly-sweet spag bols, schnitzels, cordon bleus, and mousakas, it was quite a coincidence they had something so traditionally Khmer on there. The base is coconut water - an almost colourless liquid found in young, green coconuts. 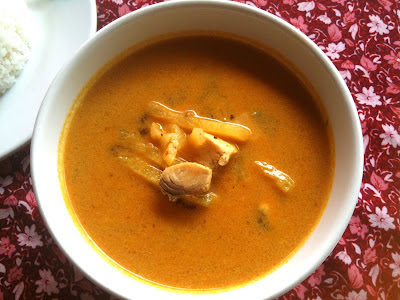 It’s vastly different to the thicker, richer coconut milk extracted from boiling coconut flesh in milk or water, that is widely used in Thai cooking. If you can’t get hold of coconut water, then heat 500ml of water in a pan, and when it’s bubbling, add one tablespoon of coconut cream powder. Or you can use the same amount of grated creamed coconut (concentrated coconut cream sold in blocks). It should be a pale white liquid, and taste slightly of coconut. Like many Asian soups, samlor ktis is very quick and easy to make - the sort of lunch you can knock up in ten minutes or so from scratch. It’s amazing the fresh, clean flavour achieved from just a handful of ingredients. 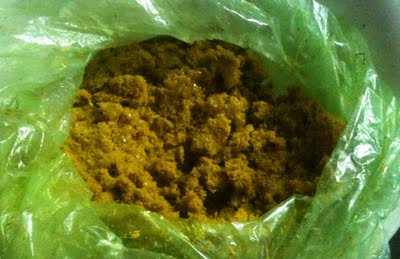 The main seasoning is kroeung (pic above) - a mild curry paste made by pounding lemon grass, turmeric, kaffir lime leaves, galangal, fingerroot (Chinese ginger), a little red chilli, and sometimes other herbs and spices. If you can’t find it in your local Asian store, you can use Thai yellow curry paste. But don’t go over the top - it’s supposed to be a very delicately flavoured soup rather than the usual fiery, coconut-heavy concoctions you find in Thailand. If you want to make it yourself, then just peel and dice three thumb-sized pieces of galangal and put them in a pestle and mortar. Add three finely chopped lemon grass stalks, three finely sliced kaffir lime leaves, one piece of peeled and chopped fingerroot if you can get it, and one peeled and chopped thumb-sized piece of fresh turmeric, or two teaspoons of ground turmeric. 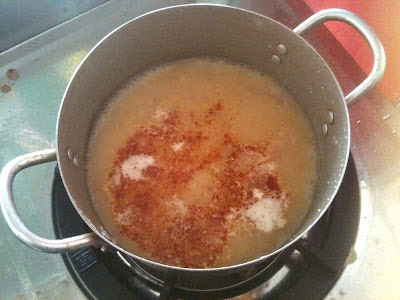 I always add three chopped garlic cloves, three deseeded red chillies, and half a teaspoon of salt. You pound the mixture for five minutes until you’ve got a moist yellow paste, which freezes well and will keep in the fridge for a week or so. Raksmei, the cook at the restaurant, started by hacking open a large, green coconut with a machete and pouring about 500ml of its juice into a saucepan. She then peeled and removed the eyes from a chunk of fresh pineapple, and cut it into thin chips. 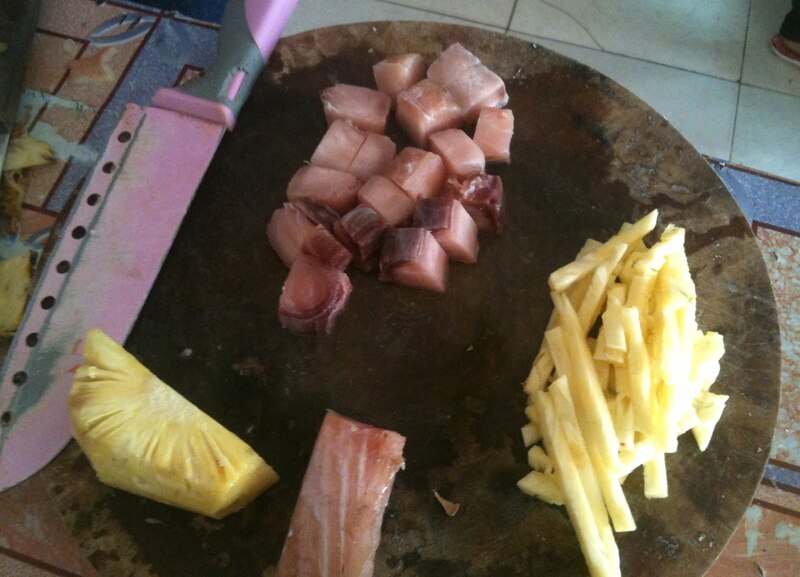 She then diced a small piece of barracuda fillet. 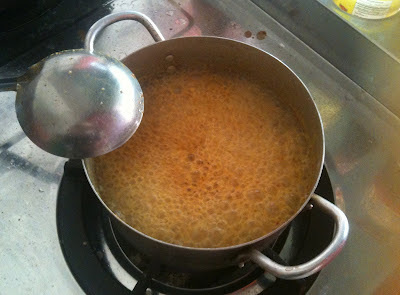 When the coconut water was bubbling, she added two level teaspoons of kroeung paste and stirred the broth for a minute until the paste was dissolved. 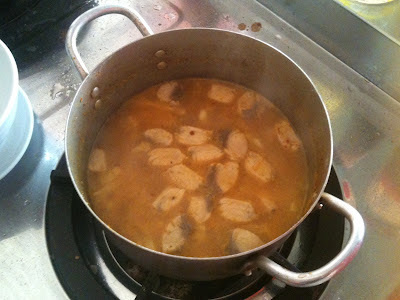 She then added the fish, stirred again, and added a pinch of salt and a teaspoon of sugar. She turned the gas down and simmered it for a minute and then added the pineapple, before simmering it for another two minutes. When the soup was ready, she checked the seasoning and added a couple more pinches of salt and sugar. It was a delicious, delicate soup. The slight oily sweetness from the fish was cut by the sharp flavour from the pineapple, which still had a good crunch when I bit into it. There was a gentle hint of spice from the curry paste, and its tiny flecks of red chilli left little more than a tingle on the tongue. 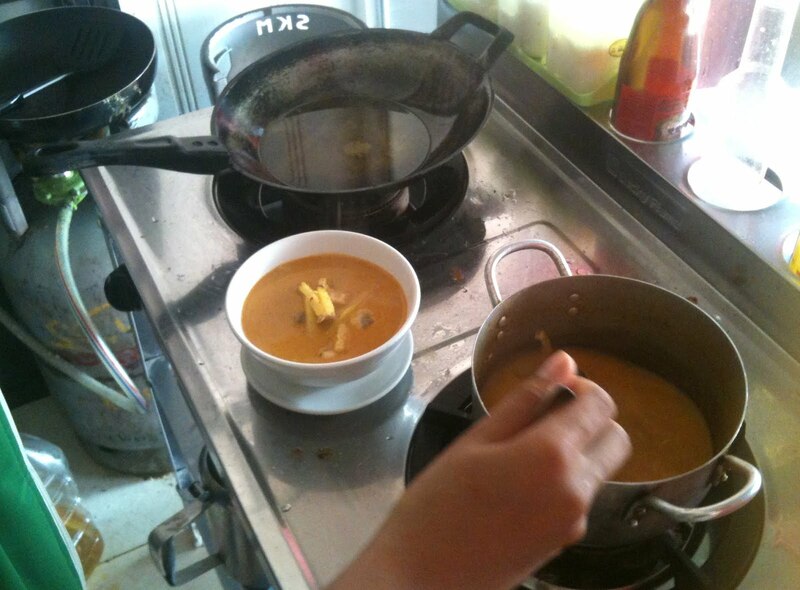 I’ve seen it made with tomato as well, which takes it closer to the many Vietnamese-style soups you get in Cambodia. They get their sourness from tamarind juice, tomato and pineapple, and are normally flavoured with fish sauce, pepper, shallots, lemon grass blades, and red chilli peppers, and are often topped with chopped mint leaves and spring onion greens. Raksmei served the soup with a little bowl of rice. She said her barang customers usually eat it with a baguette, but she’d run out of bread. It was a lovely way to eat barracuda, and would work well with any meaty sea fish like pollack or coley. It made me feel light and healthy afterwards. It even took my mind from my cigarette cravings for a while as I waited for my latest 25mg, step one nicotine patch to work - something not helped by the fact I can buy seven packets of fags for the price of one, very-hard-to-find patch out here. I’d read somewhere that soup is so important to the Cambodian diet that women often greet each with the phrase: “What soup will you cook today?” I’ve never heard them say it, but this is certainly as good a soup to cook as any. What’s Really In Your Lamb Doner Kebab?